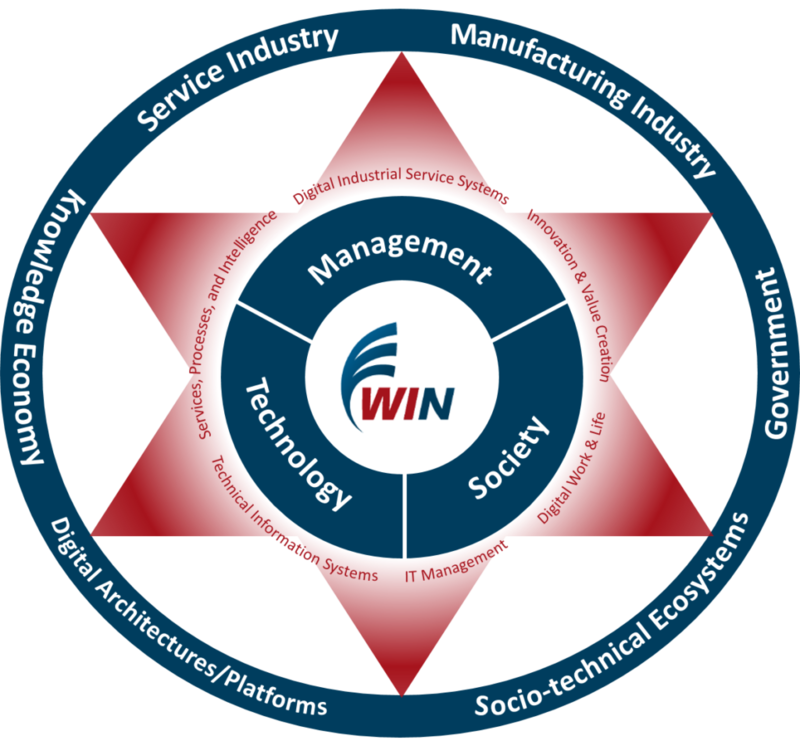 WIN – the Institute of Information Systems – is a joint initiative of the Chair of Information Systems – Innovation and Value Creation, the Chair of Information Systems – Services, Processes, and Intelligence, the Chair of Information Systems – IT Management, the Chair of Digital Industrial Service Systems, the Chair of Information Systems – Digitalization of Work and Life, and the Chair of Information Systems -Technical Information Systems at the Friedrich-Alexander-University Erlangen-Nuremberg. Located in Nuremberg, the institute is attached to the School of Business and Economics, but with close relationships to the chairs of informatics in Erlangen. To strengthen interdisciplinary research and teaching. To initiate research projects that attract outside funding. The strength of information systems in Nuremberg is the global view on information systems from an economic perspective. The main foci of interest are Innovation and Value Creation, Service- and Process Management, Technology and Project Management, Digital Industrial Service Systems, Digitalization of Work and Life, and Technical Information Systems. The collaboration of these information system chairs enables various joint projects and publications. Through interaction with our business partners, we can ensure that our research and teaching activities cover the complex social problems in the business world. Thus, we aim to establish long-term relationships with practitioners and welcome ongoing cooperation in research and teaching. Currently, the information systems chairs offer lectures and seminars for various Bachelor as well as Master programs. In 2008, the first students started participating in the Master of International Information Systems (IIS) MSc. This Master program is jointly offered by the information systems chairs. Currently, the School of Business and Economics offers a Bachelor of Economics with the major in Information Systems (Bachelor of Arts). In addition, since the winter term 2009/2010, the Institute of Information Systems offers an own bachelor program with the prospective degree of Bachelor of Science in Information Systems, having a deeper focus on informatics and information systems. This program is jointly offered with the informatics chairs at the School of Engineering in Erlangen.